In the Wiping Mask routine the actor applies cosmetic paint in a certain position on his face. If the whole face is to be changed, the cosmetic paint is applied to the forehead or eyebrows; for changes on the lower half of the face, paint is applied to his cheeks or nose; or to other specific parts. The Blowing Mask routine works with powder cosmetics, such as gold, silver, and ink powders. Sometimes a tiny box is placed on the stage; the actor draws near and blows at the box. The powder will puff up and stick to the face. Sometimes the powder is put in a cup. The secret to success in this act is to close the eyes and mouth and to hold the breath. The Pulling Mask routine is the most complicated. Masks are painted on pieces of damask, well cut, hung with a silk thread, and the lightly pasted to the face one by one. The silk thread is fastened in an inconspicuous part of the costume. With a flick of his cloak the performer magically whisks away the masks one by one as the drama develops. One Sichuan Opera master also used Qigong movements as he changed face color from red to white, then from white to black. Face changing is a magical art. Actors change more than 10 masks in less than 20 seconds! By raising the hand, swinging a sleeve or tossing the head, an actor uses different masks to show different emotions, expressing invisible and intangible feelings through visible and tangible masks. From green to blue, red, yellow, brown, black, dark and gold, these masks show fear, tension, relaxation, slyness, desperation, outrage, and so on. Sichuan Opera master Peng Denghuai changed 14 masks in 25 seconds, and reverted to four masks after revealing his true face. This was his latest Guinness World record, breaking his previous one. Hong Kong super star Andy Lau was said to respect Mr. Peng as teacher and mentor in this stunt. Today hi-tech is used to enhance this traditional art. Lasers and twinkling lights add a touch of mystery. And modern faces like Zorro are invited to the stage. 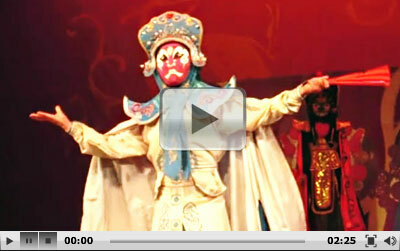 Sichuan Opera, like hot-pot and other Sichuan cuisine winners, is exciting, rich and good-natured. Hi, I would like to see the opera shaw but I dont know Chinese... how can I order tickets? And thank you for all of this halpfull articles. The tickets booking sites are only in Chinese and you can purchase the tickets when you arriving at the theater. Hello! We will stay at Forstar Hotel North Renmin Road. Is the Shufeng Yayun Tea House nearby? How to get to it from our place (any public transport or taxi)? Maria, you can take subway line 1 at North Renmin Road to Tianfu Square where you can transfer to line 2; alight at Tonghuimen and use Exit E and walk south along Qintai Road for a few yards and you will find the tea house on your left side. Samy, there are not only red dots but also other patterns. These "decorations" are used to reflect the role's characteristics. Meanwhile, the audience can easily figure out what roles the performers play by these unique decorations. Take Yang Jian for example, another eye is added on the performer's forehead. It says that Yang Jian has three eyes. Lei Gong (God of Thunder) has a lightning bolt pattern on his foreheads. Chendu Opera! how much does a ticket cost? Erick, it depends on which theater you go and what seat you choose. I was in Chengdu last year. I enjoyed Chengdu Opera at Shu Feng Ya Yuan Theater. The ticket prices are reasonable to me. VIP seats cost CNY 240 to CNY 320 while ordinary seats costs CNY 140 to 180.
where can I see the Sechuan opera? where can I buy tickets? where can I find perfornmance calendar? Is there any opera which is highly recommended? 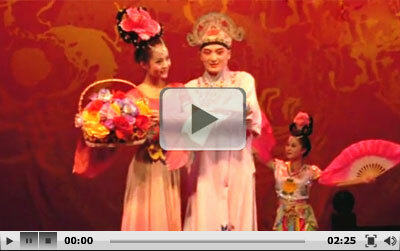 Hi, I suggest you see the opera in Chengdu, Sichuan and the local Shu Fng Ya Yun Theatre is recommended (蜀风雅韵剧院). It is located at Qintai Road, Qingyang District, Chengdu. As I know, there are performances every night from 20:00 to 21:30 and you can buy the tickets at the entrance of the theatre!